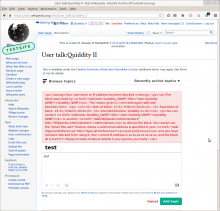 Autoblocks, regular blocks, GlobalBlocking and TorBlock are among the cases to test for this. See T128855: Unformatted html within message about ip-block (for TOR users). 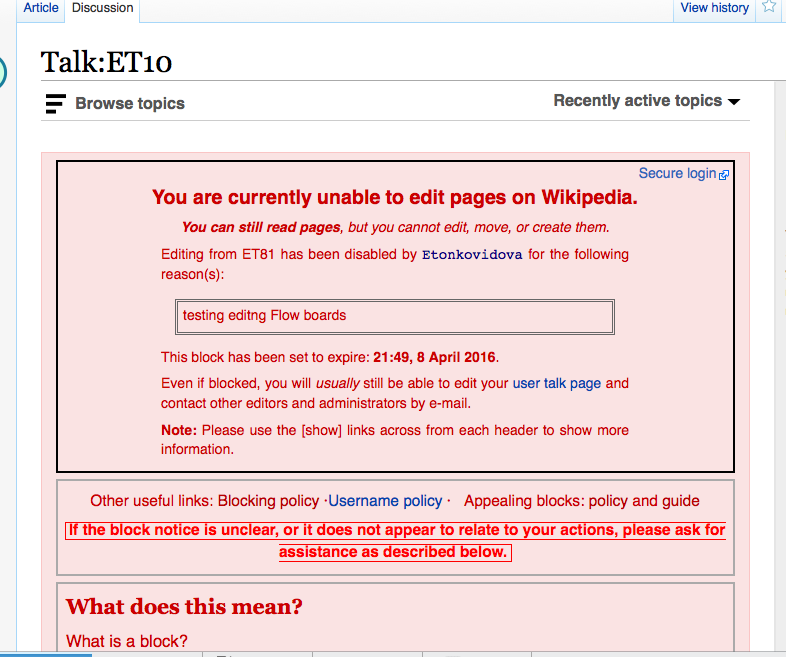 The blocked user logs in and goes to Flow board to attempt to create a new topic. 2 more example screenshots, mostly to show more of the screen, and to compare 1 Flow with 1 wikitext. These are showing a user who was blocked, with the option checked for "Prevent this user from editing his own talk page while blocked". 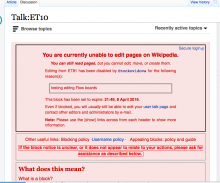 After the fix, check the case when a user was blocked without enabling "Prevent this user from editing their own talk page while blocked"; and the User talk page is Flow enabled. 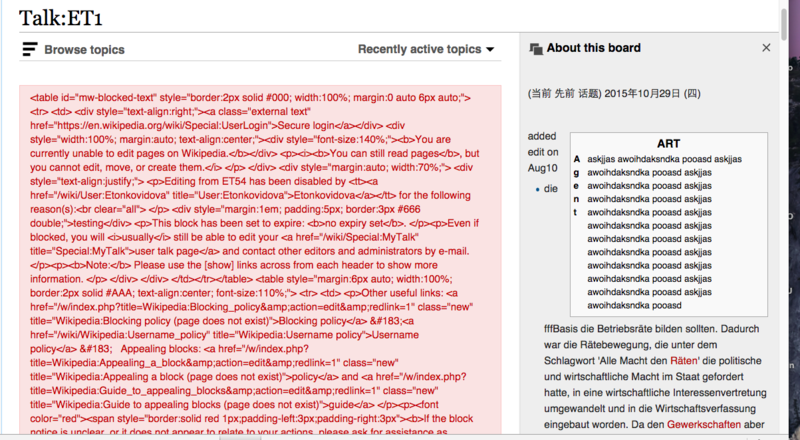 • Mattflaschen-WMF added a subtask: T69104: Add role for GlobalBlocking. 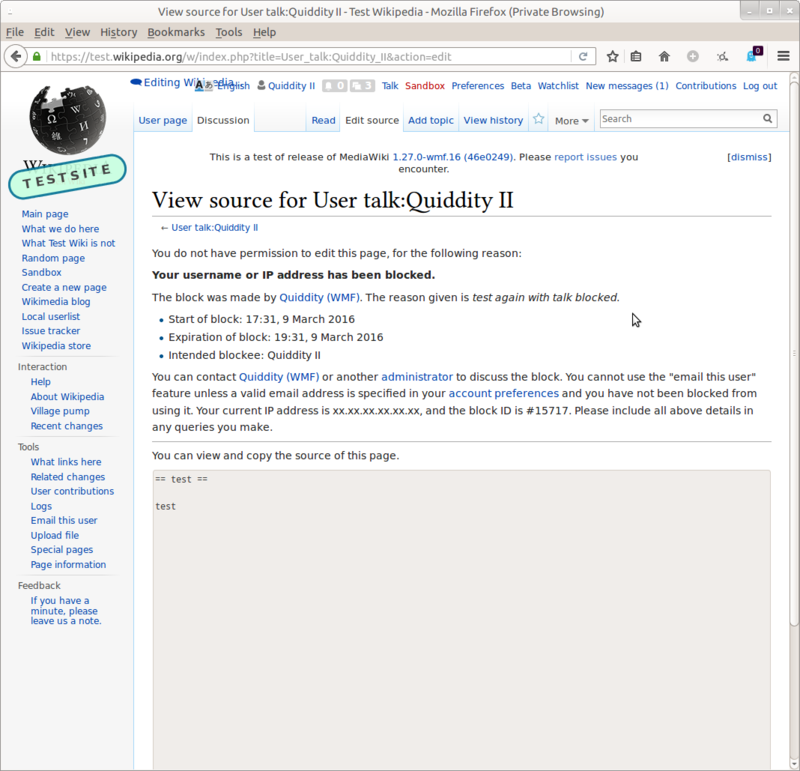 • Mattflaschen-WMF added a subtask: T130876: TorBlock role for MediaWiki-Vagrant. Remove unused error messages, switch API errors to HTML, and handle that on the client. 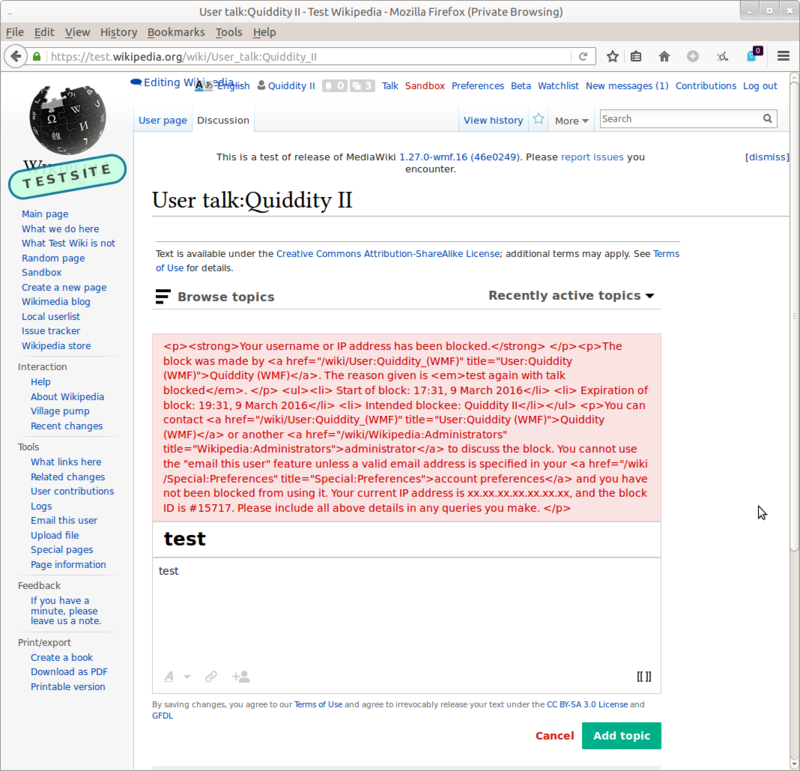 editing by blocked users (including the case when the option 'Prevent this user from editing their own talk page while blocked'). 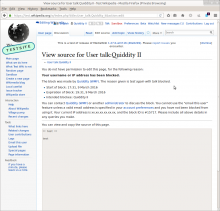 blocked users attempt to edit non-flow pages in VE or in wikitext. The proper notifications (although, somewhat excessive) is displayed. The function seems to be working properly, so I'll mark this ticket as resolved. But @Quiddity and @Trizek-WMF, please see the screenshot above -- which Elena says shows only a quarter of the full blocking message. It does seem a bit excessive. I assume these are defined by the community? If this is something you guys would like to address, please file a ticket for it. Thanks. The only real way to reduce the quantity of text, would be to move the information elsewhere, and expect the blocked-user to click-through and read it there. This is not practical - every additional click reduces the success rate.